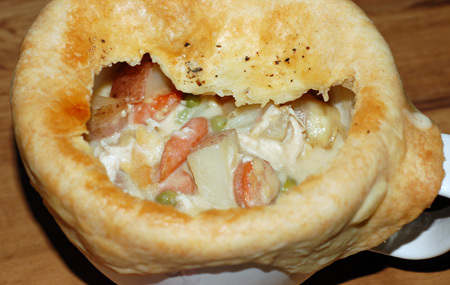 The weather here is on the verge of turning cool and wet, and we were in some serious need of comfort swathed in pie crust, so last week I set about making homemade chicken pot pies. 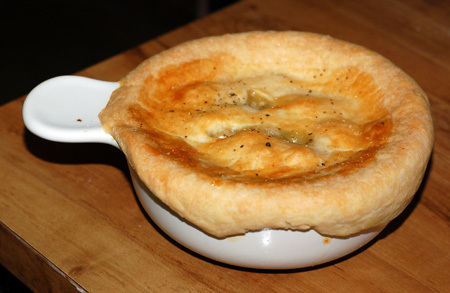 I’ve never made them from scratch before, and I have never been a big fan of the frozen version—as with frozen quiches, I find the soggy bottom crust of most potpies appalling. I decided to make individual mug pies with top crusts only. Because I was out of shortening, I was unable to use my new standard pie crust from Baking: From My Home to Yours, so I picked an all-butter crust from Tyler Florence instead, and it did the trick. For my potpie filling, I went with an adaptation of Ina Garten’s chicken pot pie, scaled back and simplified with boneless chicken breasts. Still, it’s a pretty involved recipe that takes a little while to complete, so you would be best served making lots and either refrigerating or freezing what you won’t be eating right away. This recipe made enough crust and filling for 6 large mugs, and I imagine it would double well. I baked all of them at once, and refrigerated half for another night, covered in foil; they reheated nicely in the oven at 350F for 20-30 minutes, keeping the foil on to protect the crusts from over-browning. This recipe is extremely adaptable: put in whatever meat and veggies you like, season it up with herbs, wine, or mustard, go nuts. We all really liked it—Jeremy commented about how he wanted to gnaw the crust off the edges of his mug—so I’m sure I’ll make it again sometime this winter. For the filling: In a large skillet, heat the oil over medium heat. Season the chicken with salt and pepper, and cook on both sides just until golden brown. Add about 1/2 C chicken stock, reduce heat to medium low, and simmer until chicken is cooked through and stock has cooked down. Remove chicken from the pan, cool, and shred with two forks; set aside in a large bowl. In the same skillet, pour in another tablespoon of olive oil over medium heat, and add the onion, garlic, carrots, and potatoes. Season with salt and pepper, saute until they get a little bit of color. Add about another half a cup of chicken stock, cover, and simmer until the carrots and potatoes are just tender and the stock has cooked down, about 4-5 minutes. Pour this mixture into the bowl with the chicken. Return the skillet to medium heat and melt the butter. Add the flour and cook, stirring, for a minute or two to cook out the raw flour taste. Add the remaining chicken stock and cream to this roux, and whisk to incorporate. Simmer over medium-high heat until the sauce thickens to a gravy-like consistency. Taste and adjust seasoning, then pour over chicken and vegetables; add the frozen peas to the bowl also, and toss well to combine. Divide the filling equally among 4 ovenproof bowls or 6 mugs. Divide the dough into 4 or 6 pieces respectively, and roll each piece into an 8-inch circle. Brush the outside edges of each bowl with the egg wash, then place the dough on top. Trim the circle to 1/2-inch larger than the top of the bowl. Crimp the dough to fold over the side, pressing it to make it stick. Brush the dough with egg wash and make 3 slits in the top. Sprinkle with sea salt and cracked pepper. Place on a baking sheet and bake for 45-60 minutes, or until the top is golden brown and the filling is bubbling hot.